“I’ve Just seen A Face” is a Beatles song written by Paul McCartney. It appeared on the UK version of their album “Help!” in 1965 and on the American version of their album “Rubber Soul”, released the same year. With its distinctive country feel, the song has become a staple among not only country musicians but bluegrass as well. It remains one of the very few Beatles songs that is commonly covered by bluegrass pickers the world over. 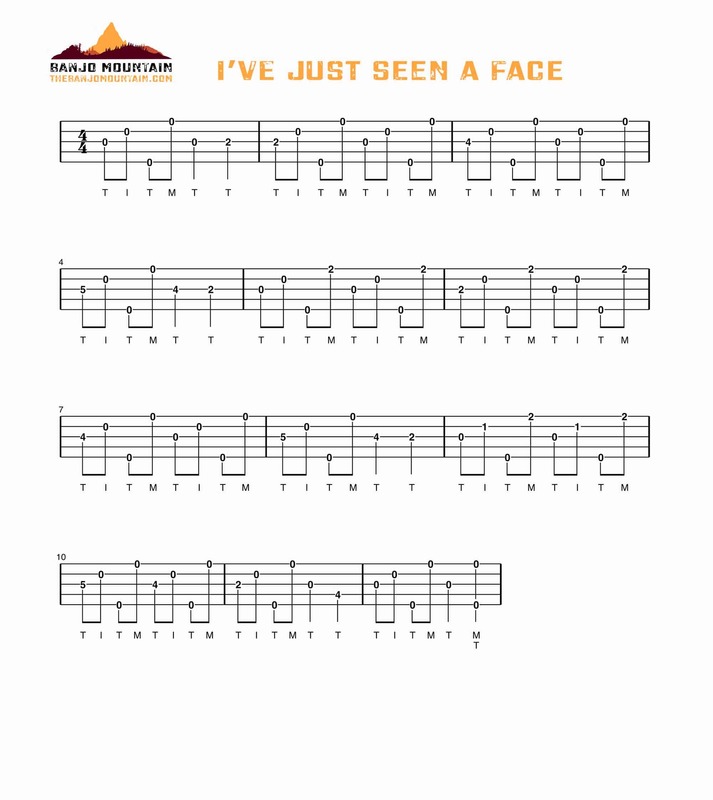 A must for any burgeoning bluegrass banjo player to learn! Note: Pay close attention to measures 9 and 10. In measure 9 you’re playing a C chord for the entire measure and then suddenly – whammo! – you’re fretting the fifth fret third string as soon as measure 10 begins. That’s one helluva transition and requires a bit of a jump for the middle finger (which, of course, will be aided by your fretting hand moving slightly to the right). Pay close attention to this part of the song and practice this transition over and over again at slow tempo until you’re able to make a smooth transition between these two measures. It’s by far the most challenging part of this arrangement!